The primary responsibility of the VisitLEX Intern is to be reliable and resourceful with an enthusiastic interest and/or knowledge of metropolitan Lexington. Interns are expected to play an active role in the marketing, convention and visitor services departments, learn about the hospitality industry and contribute valuable efforts to the success of the organization. • Support servicing of groups through registration assistance, directions, etc. • Other duties as assigned will depend on the focus of the CVB, but will include a variety of areas such as convention services, marketing, finance and general customer service. • Frequently communicates with employees and customers in person, on the telephone, and on the computer. • Frequently remains in a sitting position at a desk. • Frequently uses the computer with fingers and hands. • Frequently works in a well-lit, tempered room. • Occasionally drives motor vehicle to visit and call upon customers. • Occasionally exposed to outside elements when traveling for business. • Occasionally lifts objects weighing up to fifteen (15) pounds when moving supplies. • May be required to stoop, bend, or kneel. 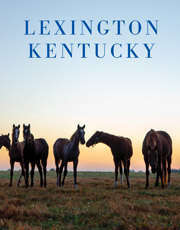 Email completed application to gborden@visitlex.com.